OK kids, you’ve got to check out this book: 30 Lessons for Living – Tried and True Advice from the Wisest Americans. It is the distillation of 300 interviews undertaken by a professor at Cornell University with elderly Americans deemed by outside consensus to have lived a good life. The lessons are spread over several different areas of concern, but “there was no issue about which the experts were more adamant and forceful” than work. The title of that chapter is “Glad to get up in the morning – Lessons for a successful and fulfilling career”. And it ain’t about the money, bub. “You know those nightmares where you are shouting a warning but no sound comes out? Well, that’s the intensity with which the experts wanted to tell younger people that spending years in a job you dislike is a recipe for regret and a tragic mistake”. Big money may not accompany one’s bliss, but following it is the only way a happy denouement might. And there’s a related lesson in this week’s Economist: “Exercise and Longevity – Worth all the sweat”. Doctors (including Dr Brother) have long known that regular vigorous exercise helps thwart all kinds of ailments, from headbone to footbone to decrepitude. Research is beginning to suggest that exercise helps by enhancing ‘autophagy’ which is the body’s own process of scrapping and recycling surplus, worn-out, or malformed proteins. It thus slows down the biological clock. 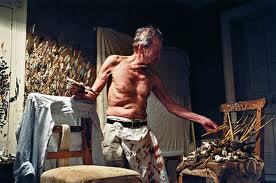 Combine a fulfilling career and vigor and you just might get, well, somebody like Lucien Freud, pictured above in his eighty-third year. He died last summer at 89, but for the nearly sixty years leading up to two weeks before passing he worked with a subject for several hours in the morning, a different one in the afternoon, seven days a week, standing up. The Lessons are for: Happy Marriage, Fulfilling Career, Parenting, Ageing Fearlessly and Well, Living Life w/o Regrets, and Happiness (Time spent worrying is time wasted – Your choice). This entry was posted on January 27, 2012 at 8:23 pm and is filed under Art, Family. You can follow any responses to this entry through the RSS 2.0 feed. You can leave a response, or trackback from your own site.